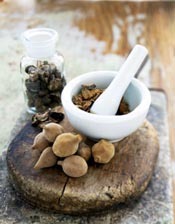 Ayurveda-literally "Science of Life"-is based on the twin principles of wholeness and balance. As a holistic healing tradition, Ayurveda recommends treating the "whole" person-body, mind, senses, emotions and spirit-instead of following the "one-cause-one-cure" principle and focusing on the symptoms of the moment. The premise is that if the roots are nourished and watered, the plant will flourish. Diet, sleep, lifestyle, daily and seasonal routines and internal cleansing are just as, or more, important than herbs and potions in order to maintain good health. And Ayurveda is equally about maintaining or preserving good health as it is about treating disorders - "Swaasthasya Rakshanam" is one of the goals of Ayurveda. Disclaimer: Information provided in these article is for the sole purpose of imparting education on Ayurveda and is not intended to diagnose, treat, cure or prevent any disease. If you have a medical condition, please consult your physician.